At the time of the character's creation, there was little expectation that Spider-Man would be more than a fad. By Theron Couch — Would you believe Stan Lee once wrote two stories for a first issue and couldn’t even keep his main character’s name straight? Such was 1963’s Amazing Spider-Man #1, which was published in a different era of comics. Back then, comics didn't tell the same sort of long-term stories that developed over years. The established pattern was fads. Readers would buy horror for a while, then westerns, then war, and so on. These fads came and went so often that few expected Spider-Man to last. Yet, here we are. Decades later and Spider-Man is Marvel's flagship character, a true icon despite his humble—almost rudimentary—beginnings. This Wednesday, a new writer will takeover Amazing Spider-Man for the first time in roughly a decade, as the creative team of Nick Spencer and Ryan Ottley debuts on the title. In preparation, I'd like to look today at that same comic's very first issue. Amazing Spider-Man #1 tells two stories that effectively pick up at the end of the character’s first appearance in Amazing Fantasy #15. Uncle Ben is dead, and Peter feels a need to provide for Aunt May. Unfortunately, J. Jonah Jameson has, via newspaper editorials and public addresses, turned the public against Spider-Man. No one will pay him for performances. Amidst this, Jameson’s astronaut son is going into space in a new capsule. The guidance system falls off, and only Spider-Man can get on the capsule to reattach it as it plummets toward Earth. Peter is certain this act of bravery will show the public he is no menace, but Jameson twists events to blame the accident on Spider-Man. 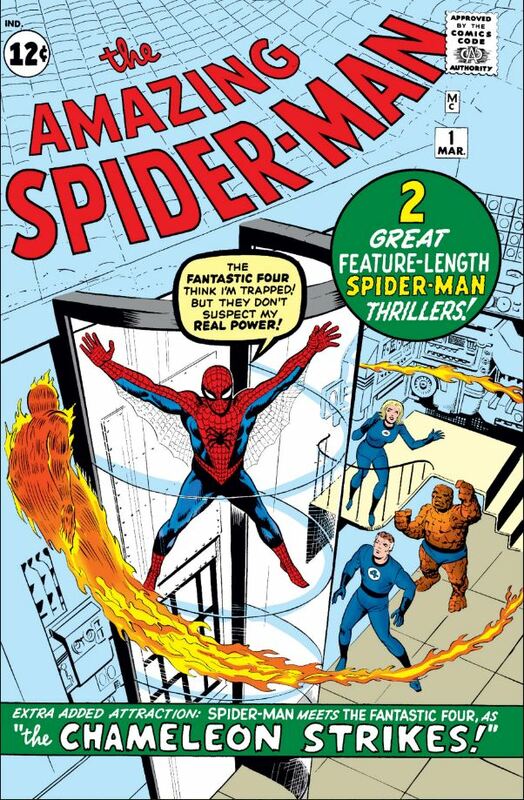 The second story begins with Spider-Man breaking into Fantastic Four headquarters, hoping to show-off his abilities and get a paid position. Unfortunately, the FF don’t have paid positions, so Spider-Man leaves, which makes him vulnerable to a frame job by the Chameleon, who has stolen secret plans for the reds. Spider-Man, initially the patsy, saves the day, but this confusion further fuels public belief that he’s a menace. The issue ends with our hero wishing he’d never gotten powers. Spider-Man as drawn by co-creator Steve Ditko was less muscle-bound than the version we often see today. Today, Amazing Spider-Man #1 stands as a fascinating look at an iconic character’s past. Steve Ditko’s art established lasting looks for many characters, including Jameson’s trademark mustache and Spider-Man’s distinctive costume, but Ditko also portrayed Peter Park and Spider-Man in a very different way than most contemporary artists. For starters, this character is truly built like a teenager; Peter is lean rather than musclebound, and that shows even when he’s in costume. Peter is also frequently angry in both stories, as conveyed by his facial expressions. Anger is a rare look for Peter. As for the action, the big difference is that web swinging isn’t a thing yet, and Spider-Man walks across his webs like a tightrope. More memorable than Ditko’s contribution to the different feel, though, is Stan Lee’s. 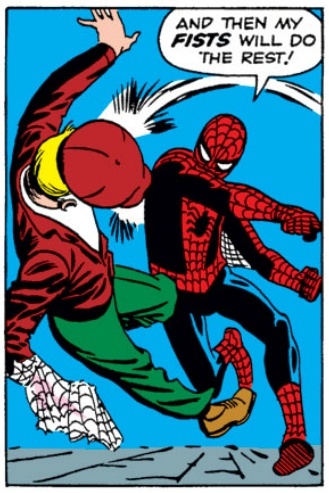 In the first story of the issue, the character is Peter Parker; in the second story his name is Peter Palmer. His characterization is also inconsistent. Sometimes he’s sympathetic—when he worries about supporting Aunt May—and other times he’s confrontational, insulting, and antagonistic, especially during Spider-Man’s encounter with the Fantastic Four. Throughout the story, Peter consistently looks to use his powers as a means to an end, rather than a purpose in and of itself. This issue doesn’t even have a hint of the weight of responsibility at the heart of Spider-Man stories today. In some ways, Lee’s Peter Parker is unrecognizable to modern readers. That the character could be so different is hardly surprising, though. Lee and Ditko were producing Marvel’s next big thing at a time when comics rarely lasted for years, let alone decades. Lee and Ditko were simply trying to captivate their audience for as long as possible. It didn’t matter that Lee couldn’t keep his protagonists’ name straight, so long as he entertained readers. It also didn’t matter that Peter was sullen or antagonistic or confrontational—this new Spider-Man character was exciting, and, besides, who knew what he would do next? Today, Spider-Man comics are produced with the assumption that they’ll always be produced. Therefore care is taken to keep the product high in quality and the themes—especially the responsibility theme—consistent. It’s fun and refreshing to go back to a time before Spider-Man was SPIDER-MAN. Responsibility is still Peter’s motivation; beyond that, though, he’s almost another person. Then again, he was named Peter Palmer in the beginning, so perhaps he actually was another person.